Crystal Cruises is offering its well-heeled guests a world of options for celebrating the festive season this year, most notably New Year’s Eve. Each of the company’s four ultra-luxury vessels will sail distinctly special voyages, each presenting unique and exclusive opportunities to ring in 2017 in the utmost luxury. Crystal Cruises’ Crystal Symphony and Crystal Yacht Cruises’ Crystal Esprit will both place guests in the heart of two of the most spectacular fireworks displays in the world – in Sydney and Dubai respectively. Meanwhile, Crystal Cruises’ Crystal Serenity and Crystal River Cruises’ Crystal Mozart will host lavish cocktail parties and special feasts on board as the vessels enjoy the picturesque and tranquil settings of the Caribbean and Danube River respectively. “A cornerstone of the Crystal Experience is the choice to choose the luxury holiday that best suits one’s style and wishes. Whether you prefer the thrill of a world-class celebration or an elegant cocktail event in a picture-perfect location, a celebration with Crystal is the best way to start the New Year,” says Crystal CEO and president, Edie Rodriguez. For travellers seeking glitz and glamour on New Year’s Eve, Crystal Symphony and Crystal Esprit will each enjoy distinctly special and extravagant celebrations. 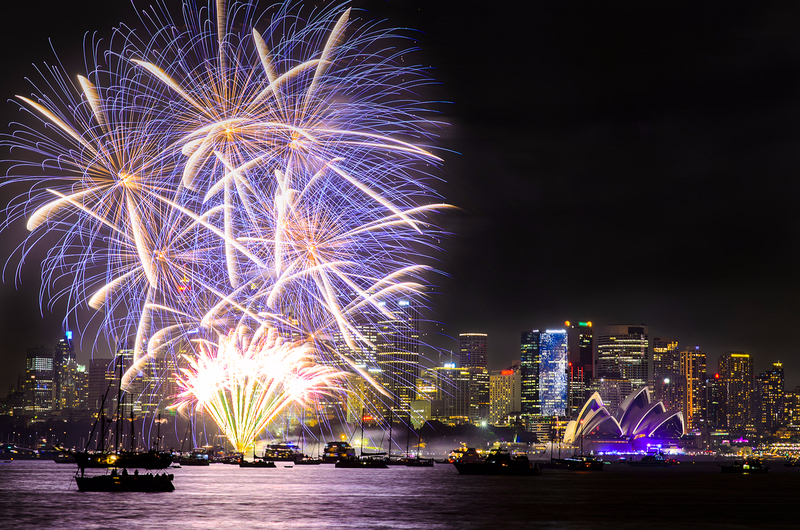 Amidst fifteen glorious days exploring the vast wine country, rolling farmland, sculpted mountain ranges and pristine beaches of New Zealand and the Outback, guests will find themselves in the centre of the famed Sydney Harbour for its annual New Year’s Eve fireworks extravaganza. More than just a great view, Crystal guests will take in the lavish festivities aboard one of two specially chartered catamarans, and will participate in the Harbour of Light Parade. An impressive flotilla of vessels decorated with an array of rope lights and adornments will parade across the Harbour from Goat Island to Cockatoo Island and back. An elegant feast will be served aboard the chartered vessels, while champagne flows and music from a live band and a DJ plays. The celebration culminates with one of the most impressive pyrotechnics displays in the world, with Crystal’s guests enjoying the illumination from the open decks of the catamarans. The epic show, combined with the rugged wilderness and cosmopolitan culture found in Sydney, Melbourne, Auckland, Christchurch, Dunedin, Tauranga and Wellington, make this perfect festive voyage. All inclusive fly/cruise prices from £8,002 per person. Crystal’s luxurious yacht affords front-row access to many of the world’s most exclusive locations and events, including the famous New Year’s Eve fireworks show in Dubai. While the rest of the world watches the 19-minute spectacular on television, Crystal Esprit’s 62 guests will enjoy a VIP vantage point to take in the entire show. The record-setting extravaganza stretches down the expansive beach to the Burj al Arab, where Crystal Esprit will be anchored. The voyage travels to and from Dubai, through some of the Cosmopolitan Emirates most iconic hubs. Visits to Doha, Muscat, Sir Bani Yas Island and Abu Dhabi (overnight) allow travellers to immerse themselves in the contrasts that are artfully exhibited by the sleek, brand new modern structures that pay homage to the region’s ancient masterpieces. All inclusive fly/cruise prices from £8,787 per person. Travellers preferring the elegance of a hosted festive celebration on board one of Crystal’s ultra-luxury vessels may opt for the stylish soirees planned for Crystal Serenity and Crystal Mozart. Both the award-winning ocean ship and Crystal’s new river ship will host lavish banquets and cocktail parties, with live music and dancing, traditional New Year’s countdown and special evening entertainment. Crystal Serenity sails a 14-night, warm weather voyage round-trip from Miami, trading the winter chill for tropical calls to Mexico, Jamaica, Dominican Republic, Puerto Rico and French West Indies. Crystal Mozart’s 13-night round-trip from Vienna along the Danube River will transport guests to holidays past, with visits to charming European villages sparkling with traditional holiday markets in Austria, Hungary, Germany and Slovakia. All inclusive fly/cruise prices start from £6,484 per person for Crystal Serenity’s Caribbean voyage and from £3,635 per person for Crystal Mozart’s Danube itinerary.